A small but dedicated group gathered at Namgyalgar to understand and immerse ourselves in the practice and breathings of Mandarava. We were all so grateful to be assisted by Ro, who spent many hours listening and transcribing the teachings on the Tsalungs. By the end of the two weeks, I think we all had a much clearer idea on how to take these powerful practices into our daily life. We all hoped that while we were doing the practice of Mandarava that we might benefit the health of our master. Namgyalgar has been going through the last breath of summer and this year in Australia we have certainly felt the heat. We welcomed the coolness of lots of rain and the green that soon followed. It made our Vajra dance practice more effortless as we didn’t have to contend with the beating rays of the sun on the tin roof just above our heads. 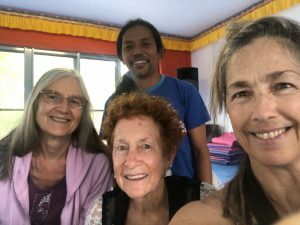 Some of us who are new to the Song of the Vajra were very grateful for the opportunity to do some sustained practice together and I think we all felt that we made valuable progress. During the two-week period we operated a food co-op and cooked and ate together. 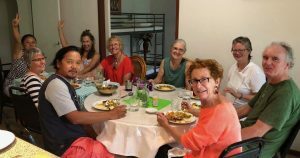 With practicing, dancing, cooking and eating together it was such a valuable time to get to know each other more deeply. We are a small gar and we do feel our isolation in such a huge country, however, during this retreat people came from as far away as Sydney and Melbourne. Sometimes distance and isolation can help to draw us together and make time spent together so much more precious. Namgyalgar is set in a ring of middle-earth-realm mountains, is drenched in native birds, green, green grasses and even has a tiny swimming pool perched on its edge. 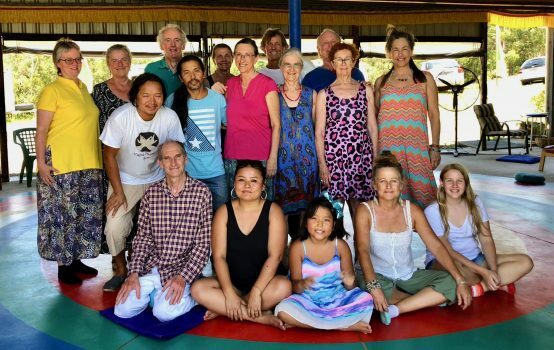 It was to there that we four or five lucky practitioners retreated to take part in the Tsalung teachings in February this year. Firstly, we created a food and cooking co-op, then all nestled in for the next fourteen days and nights with glad intention. To complement each evening webcast teaching with Namkhai Norbu Rinpoche from Tenerife, every early sunny morning at 7am we gathered in the gönpa to practice, then ate brekky together, then at 10 am others travelled to join us and we all gladly tripped the light fantastic on the mandala to further improve our Song of the Vajra dance. Next, it was on with the cozzies, as the steamy humidity of noon heat drove us into the clean, sparkling pool. Later, after an excellent lunch and rest period, in the cool of early evening we sat together in the office, listening to Elio, Fabio or Nina give clear, explicit instructions on Rinpoche’s previous night’s teaching. Finally, at 8, it was time once again to tune in to Dzamling Gar once again. Everyone who came enhanced our retreat, so we danced gladly, processed diligently and realised right into the nitty gritty of us, not only the profound teachings, but also how fortunate we were to be at Namgyalgar itself; and made a point of remembering to thank all the members across Australia for their constant support of our amazing gar. One and all cooked, cleaned, swam and studied in harmony, and sure we all agreed that Ro was the fantastic force as she voluntarily bought us further clarification on the dance floor, took and forwarded notes on the teachings, and cared well for each and every one of us. On the final day in a really beautiful way to celebrate our time together, after lunch, Tommy set us alight as he plucked guitar and sang songs from times gone by, folk songs, witty songs, fun songs…making the retreat in all a most marvellous few seconds in the vastness of the universe. This year, Losar at Namgyalgar was a very special experience with a small closely-knit group practicing together for the two week period. Our routine was simple: on rising we did the Mandarava Long practice, then after breakfast and chores we danced the Song of the Vajra until lunchtime; afterwards we rested and then gathered to listen-in to replays of explanations of the Sogthig and Tsalung breathing practices; later still reassembling to follow the evening webcast from Dzamling Gar. The next day, we tried to put it all into practice. 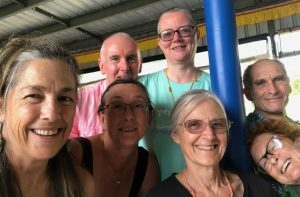 Our little group was skilfully led by Ro who went to much trouble to provide us with notes on the breathing practices particularly, and each day we’d grow more confident and grateful for all her diligence and hard work.